The most interesting thing is that both of these teams appeared at about the same time, the end of the 1950s, and were disbanded 5 years after this match in 1970. In 1959, with the support of the Kremenchug Plant of Road Machines, the Dnepr team was created, which was quite successful in the “B” class. The team took part in 10 USSR championships. From 1963-1969 The team held 406 meetings. In the first two championships, the team took the last places in the zones, and then Dnipro became the third in the final tournaments of the Ukrainian B-class teams and won a pass to the 2nd class A group. The team was headed by Boris Usenko. In the class “A” Kremenchug players spent one season. And in 1970 the team ceased to exist. That year 1956 should be considered the beginning of the future team of masters “Avant-garde” Yellow Waters. KM Kolbus became the first coach of the created team. Since 1958, the team became known as Avangard. Then came the first success. The team won the spring regional championship and received a ticket to the USSR championship among KFK teams. 1959 was a triumphal year for zhelkovodtsev. First, the regional championship was won: 15 wins, goal difference 95-7. In 1960, Avangard made its debut in Class B. The first season was more than successful. The team, representing not even the regional center, but the town, two years ago – an urban-type settlement, took the 5th place out of 19 teams in the 2nd Ukrainian zone of Class “B”. 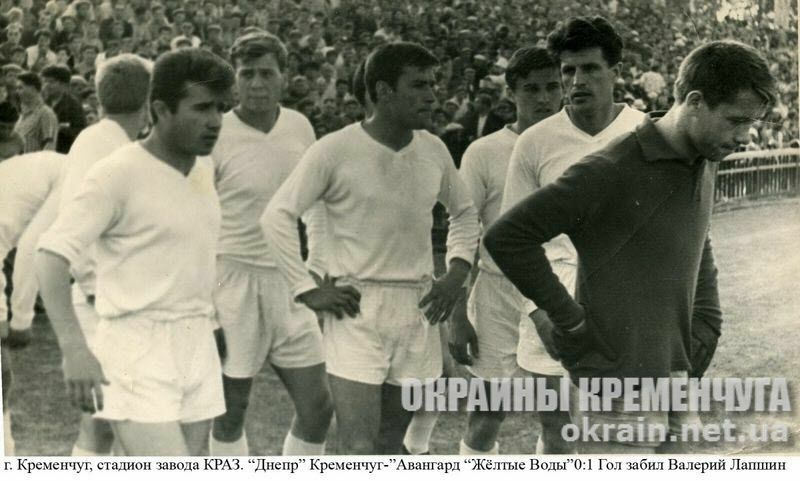 In 1962 the club was replenished with players – young Vladimir Brazhnikov and high-level player Vladimir Kovalenko. During this period, Avangard spent another ten seasons in a row in the national championships, became the winner of the Ukrainian championship (1965), champion (1966), two seasons (1967-1968) performed in the second class “A” group. In 1970, the team was disbanded.